The Brabant canal network is a park, the longest blue-green park in the Netherlands. The Brabant canal network is a park, the longest blue-green park in the Netherlands. In 1928 the Belgian surrealist painter René Magritte painted a realistic image of a pipe with the text below it "This is not a pipe". With this he pulled the visitor away from the subject and to the materials of the work, oil on canvas (Magritte Surrealisme, 2018). The same applies to the Brabant canals. By disassembling the canals, you discover the ingredients for a diverse and exciting park that extends all over Brabant, from now on I call this discovery Brabantpark! By applying René Magritte's way of looking (Magritte Surrealisme, 2018) at the canals, these canals are presented in a different light; they are now not a port-to-port connection, like a subway system, but an exciting green-blue park with ingredients such as water, rivers, routes , bushes, avenues and a diverse collection of landscape and urban spaces. This park is a new recreational main structure for Brabant and Brabant City (the five largest cities of Brabant). Cities that are linked by Brabantpark with a shortage of recreational routes gain opportunities to areas such as the Biesbosch, Loonse and Drunense dunes and De Peel. To illustrate the Brabantpark experience, I like to take you on a tour. We start sailing along the green Zuid-Willemsvaart with the typical Brabantpark organic watersides towards lock 4. Here we step off while the ship is waiting for the lock and thank the skipper who has taken us with him on his cargo ship in the Brabantpark hop on/off system. We are now at a new Brabantpark junction from where we enter the Brabantpark area with the new route network. Organic banks along the canals create new ecological connections for flora and fauna uniformly along the entire canal, linking forest areas and river valleys along Brabantpark. For the visitor of Brabantpark, the water is now approaching in a friendly manner. These banks, but mainly the canals, can also be experienced from the water by means of the hop on / off possibility of cargo ships. These ships must wait for every lock and low bridge. This waiting time will be used economically for Brabantpark visitors. This creates a transport system that is complementary to the existing infrastructure. As a result, fewer parking spaces are needed, remote parts are accessible and not damaged by new infrastructure. By using disused sluiswachtershuisjes (lockguard houses, the locks are remotely controlled nowadays) (Verkade, 2017) (Brabant, Erfgoed;, 2014) as waiting room and bicycle storage the recreationalists can comfortably wait for the next ship and store their bicycle for the next weekend. This is in line with the trend that recreational users find accessibility and reachability more and more important. In the Brabantpark app that cooperates with the former lockguard houses I have selected three routes for today. 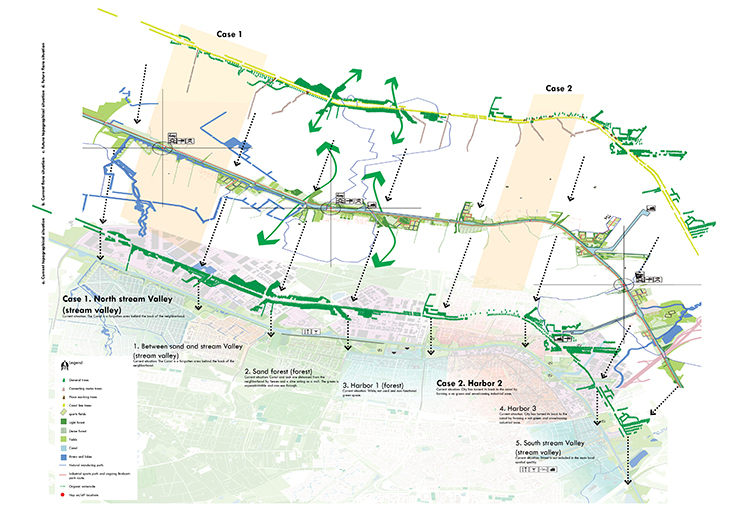 Two routes around Veghel, illustrating the relationship between the Aa river and the Zuid-Willemsvaart and a third route near Haghorst, where the Wilhelminakanaal crosses the Reusel river. Then we will look in Tilburg at the new Brabant Park. A wild park that reverses the industrial effects on the city without losing identities. From Sluis 4 in Veghel we start our first city walk. From the lock we walk along the Zuid-Willemsvaart towards the crossroad, where the harbor channel of Veghel begins. Brabantpark has provided a viewpoint that is suspended from the viaduct to allow the visitor to see the length of the canals. Here we also find our first Brabantpark "frame" that we scan with the app, that shows us what it used to look like. We continue our route along the harbor channel, Heilighardplein, Hoogstraat and then we arrive at the river Aa and the Markt van Veghel. We have now walked from industrial Veghel to the historic core of Veghel. The city has grown to the canal but originated around the Aa. This is explained in the second Brabantpark "frame" along the route. The route continues downhill, where we also encounter the Brabantpark kayak route and use the new path that meanders along with the river and thus forms a contrast with the straight lines that follow the canals. After the city we enter the countryside area. We start again along the Zuid-Willemsvaart on the spot where the Germans crossed the canal in May 1940, that is the content of the first frame. Through the open production landscape we walk down through the closed forest. Here a new paved path is provided so that this part of the route is also available for cyclists. After the forest we go further down through a small-scale coulisse landscape towards the river Aa, where the route connects to the new path that meanders along with the river and the Brabantpark kayak route. The relation channel and the Aa are explained in the second Brabantpark "frame" that we encounter. 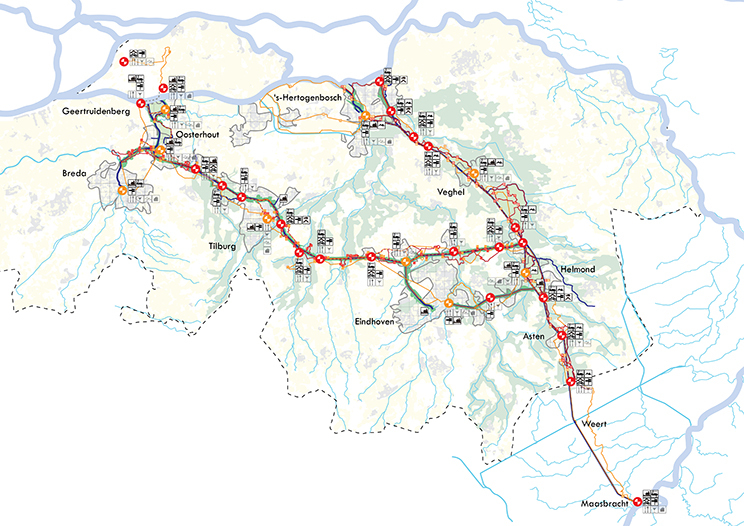 The route emphasizes the scenic qualities that the area shows between the Zuid-Willemsvaart and Aa river stretches. To the west of Haghorst we are going to start our next route from the Wilhelmina canal, where we get to know a canal in a Brabantpark-frame that has never been build towards the south (Wenting, 2011). 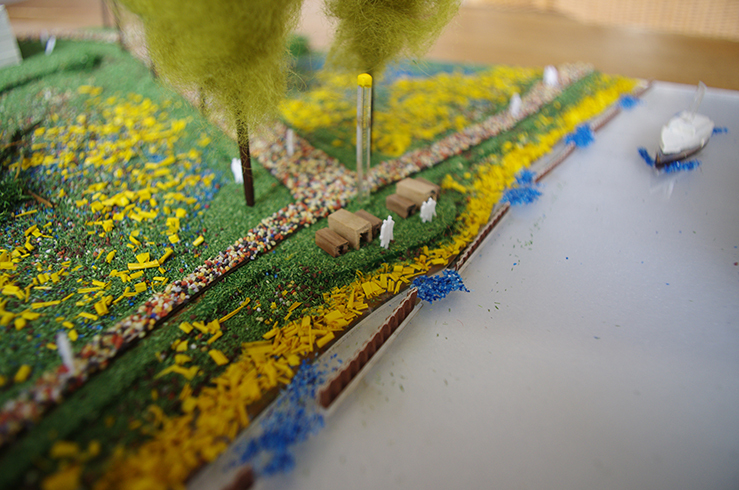 We descend the canal dike and go through the open production landscape towards the river Reusel. Cross this at the petting zoo and then, following a new walking path, we follow the meandering river back towards the canal. Towards the canal, we can see how much higher the canal is in relation to the landscape and that the river Reusel passes underneath the canal. (Kerkhof, 2018) The "frame" that we encountered at the river bridge has informed us about this before. From the canal, which forms the constant in Brabantpark, the route runs to the special feature of the landscape room. In this case the room is a river valley and the special feature is the river that formed the room. In Tilburg the canal cuts through the city, but it also connects the city. It is not a channel, but like the rest of the canal system it is a park and part of Brabantpark. Here consisting of two river valleys, a forest area and the zones where the city has withdrawn from the canal in various ways. When we walk the park completely we recognize the canal industrial ports, that form an interruption in the new Brabantpark organic watersides with adjacent street profiles and public spaces that introduce a new openness and separation between public and private, so that residents now live in the park instead of the street that happens to be along the canal. Brabantpark connects itself with the urban zones perpendicular to the canal by making existing routes recognizable, breaking through barriers and softening with a reduction in planting and the introduction of gradual differences in height. In the length, Brabantpark contributes to the unity of the city by forming a recognizable continuous park connection the various urban zones. Arriving in Tilburg we take the second intersection coming from Haghorst as the starting location. This is lock 3. A lock that has recently been replaced. The original lock is now unused next to the new one, there is a bridge over the locks that we will soon take to enter the "Brabantpark, Wild Citypark". In front of the lock entrance is one of the characteristic Brabantpark scaffolding that we use to get off. From here we go towards the original lock, where we can park our bikes, eat, drink and overlook the park through the information that links to the Brabantpark app. From the center of Tilburg we walk towards the Wilhelminakanaal, accompanied by the recognizable materials such as metal, cobblestones and ship boulders that run into Brabantpark. Arriving at the canal we are on a Brabantpark industrial waterfront jetty and we look out over an urban Brabantpark landscape and recreation trails with pastures, wetlands and Sportkanaal routes. 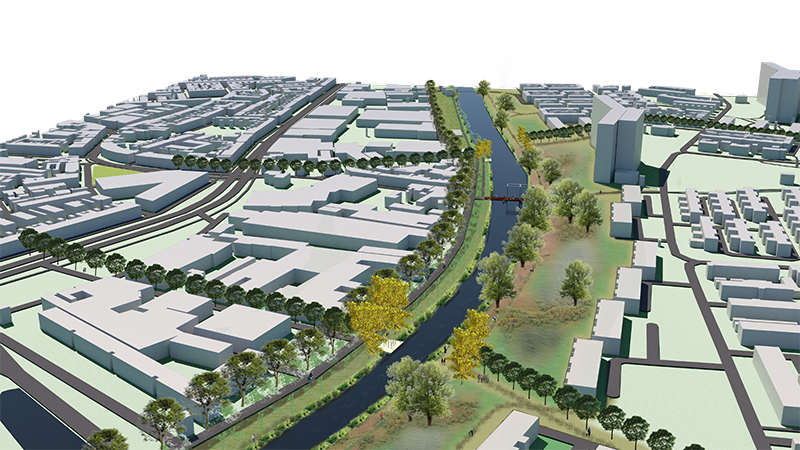 The Brabantpark green structure will be continued on this part of Brabantpark in the form of an ecological park with wadi's linked to the canal through which the original paths run on their original height level. By cutting into wadis and Brabantpark places, subtle differences in elevation arise with wet and dry proportions, making the public space more diverse and larger in perception. The example zone "Living on a green channel" is built up in three design layers. The basis is laid by the landscape of wadis and the organic Brabantpark banks. The landscape is made accessible by a route network that in the south focuses on continuity, direct connection to the sports facilities and the relationship with residential areas. Materialization is industrially related. In the north, the relationship between Brabantpark and the residential area is by the introduction of a fine-meshed informal stray network between and trough the wadis. The places give function to the routes and the landscape. 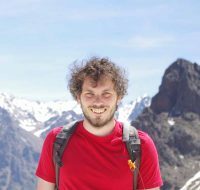 The south is sport related with space for, for example, running, cycling or Nordic walking on the trails and fishing, viewpoint and recreational mooring on the places. In the north there is space on and between the paths for walking and playing. The places are arranged as relax and picnic spots along the canal. Brabantpark is not a park for Brabant, but from the Brabanders. Along, in and around Brabantpark we encounter agricultural recreational and tourist functions that partly finance the Brabantpark routes and in this way finance and maintain their own connection to Brabantpark. With this, these local participants create Brabantpark. Local entrepreneurs, residents and municipalities build Brabantpark, coordinated and co-subsidized by the province and the government as a stimulation fund. As a result, Brabantpark is growing at the pace of the local Brabant recreational economic pace. 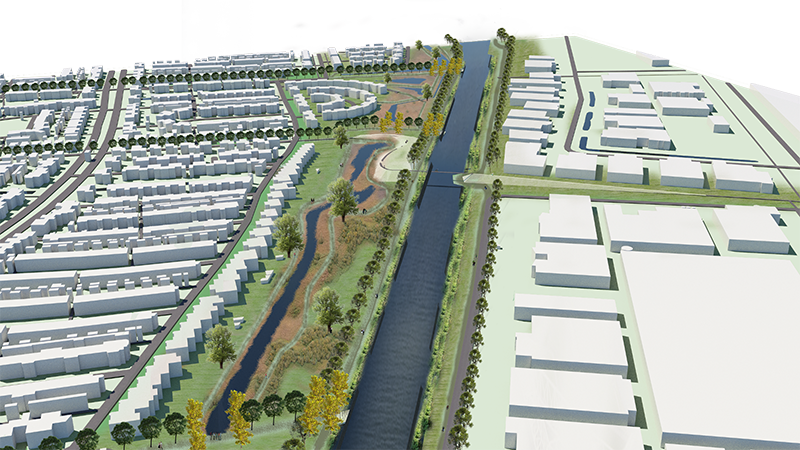 The ambitions, opportunities and consequent objectives that form Brabantpark can be summed up in three layers, landscaping (the base layer is approached from the water and channel perspective), route layer (channel and landscape leave their autonomous state and connect with the local environment) and functional places (goals and destinations with Brabantpark secondary use). The canal system of Noord-Brabant is not a channel system, but it is the longest park in Brabant that connects urban centers. The introduction of organic banks also creates a robust ecological connection between river valleys and wooded sand ridges. This newly defined park will accompany a Brabantpark route structure. This consists of a transport system that uses the cargo ships and has hop on/hop off places, where the ships have to wait for bridges and locks. From these intersections there are expandable routes that circle for an hour each by bicycle or on foot along the canal and emphasize to the subject of the landscape room in which they are located. Nevertheless, the park is not only functionally a route structure, but also forms a new recreational vehicle for the Province of Noord-Brabant. This park function creates unity in Brabant and its cities. It brings accessibility and recreational value to quiet Brabant landscapes while it introduces rest and space in the Brabant cities in the form of a ribbon park. Brabantpark is using existing qualities for a new recreational line in Brabant. Brabant, Erfgoed;. (2014). Erfgoed en erfgenamen. 's-Hertogenbosch: Provincie Noord-Brabant. Jan Timmers, R. B. (2017). Cultuurhistorie van het landschap in het zuiden van het dal van de Aa. . Asten en Someren: Omgevingsdienst Zuidoost-Brabant. Provincie Noord-Brabant. (2014). Structuurvisie. s'-Hertogenbosch, Noord-Brabant. Stichting wandelplatform. (2010). Nationale wandelmonitor. Rotterdam: De Nieuwe Grafische. STOWA (Stichting Toegepast Onderzoek Waterbeheer). (2009). Water terug in de stad. Utrecht: STOWA.